MPL and the Concord Music Group are proud to announce two more landmark instalments in the multiple GRAMMY-winning Paul McCartney Archive Collection. On 2nd October, 2015, Paul’s early ‘80s back-to-back classics ‘Tug of War’ and ‘Pipes of Peace’ will receive lavish multiple configuration reissue treatment including exclusive 2015 remixes of both the entire ‘Tug of War’ album and the ‘Pipes of Peace’ classic collaboration with Michael Jackson ‘Say Say Say,’ a treasure trove of previously unreleased tracks and never before seen video, and much more. Released in 1982, ‘Tug of War’ was Paul’s first album following the break-up of Wings and his third solo LP overall. Hailed upon its release as “exquisitely crafted” by The New York Times and a “masterpiece” by Rolling Stone, ‘Tug of War’ went to #1 in no less than nine countries. ‘Tug of War’ yielded such classic tracks as Paul’s #1 duet with Stevie Wonder ‘Ebony and Ivory,’ the top 10 single ‘Take It Away,’ and of course ‘Here Today,’ the conversation Paul never had with the late John Lennon that remains a staple of Paul’s live set to this day. ‘Tug of War’ will be issued as a 2-CD Special Edition comprised of the 2015 remix of the entire album, plus a second disc of bonus audio featuring eight previously unreleased demos of both album tracks and outtakes ‘Stop, You Don’t Know Where She Came From’ and ‘Something That Didn’t Happen,’ as well as demo and solo versions of ‘Ebony and Ivory’ and more. The ‘Tug Of War’ 3-CD/1-DVD Deluxe Edition adds the original 1982 album mix and a DVD featuring original music videos for the album’s singles and the brand new 18-minute documentary ‘Fly TIA—Behind The Scenes on Take It Away’ featuring previously unseen archival footage. 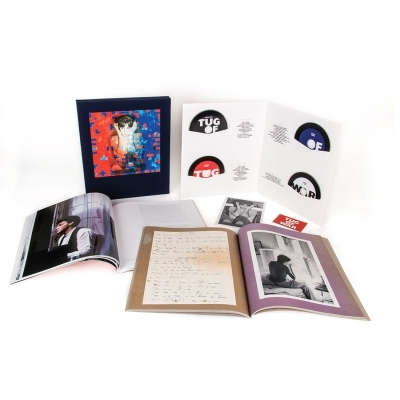 In keeping with the award-winning Paul McCartney Archive Collection standards, the ‘Tug of War’ Deluxe Edition will include a 112-page essay book and 64-page scrapbook, while the strictly limited run of 1000 Super Deluxe sets will arrive in a limited edition acrylic slipcase with five hand numbered prints of images from the Linda McCartney archive. Both albums and their companion bonus audio discs will also be released as 2-LP 180-gram audiophile vinyl editions complete with gatefold sleeves and download cards. The newly remixed and mastered ‘Tug of War’ and remastered ‘Pipes of Peace’ will also receive standard and Hi Res digital releases, as well deluxe digital and Hi Res releases featuring all bonus audio. ‘Tug of War’ and ‘Pipes of Peace’ are the newest instalments in the acclaimed and ongoing Paul McCartney Archive Collection. The inaugural release in the series, the Deluxe Edition of Paul McCartney and Wings’ 1973 milestone ‘Band on the Run’, won the 2010 GRAMMY Award for Best Historical Album, while the Deluxe Edition Box Set of the 1976 classic live collection ‘Wings Over America’ took the 2013 GRAMMY for Best Boxed or Special Limited Edition Package. Previous releases in this ambitious reissue program encompassing 41 years of timeless material from the most successful songwriter and recording artist of all time include solo works ‘McCartney’ and ‘McCartney II’, Paul and Linda McCartney’s ‘RAM’, and Wings’ ‘Venus and Mars’ and ‘At The Speed Of Sound’.